“Scrubbing” is the term used to describe the process of finish-shaping a machine-cut blank. 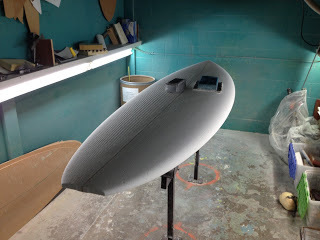 Here is one of seven SUP blanks I’ve agreed to scrub for my buddy/glasser Ray. It’s an 8’10” SUP. At this point, I have the right side of the deck ready for finishing. Next I’ll do the left side and then the bottom. The nose and tail, where the blank is held by the machine, needs a slight bit of shaping. I like to do the rails last. Then I fine-sand the whole blank and put it in the rack for glassing. Yeah, I know, not very exciting. This process of scrubbing machined blanks is how 80% of the boards you see in surf shops are done.